I’m excited to share with you a little bit more about how I got started with my career in fish medicine. I will try to give you some more fishy fun about once a week. If you have any questions, please feel free to ask! When children are young, parents have a set list of go-to bribes they have handy whenever a trip to the dentist or a visit from Strange Aunt Sally comes up. While candy and toys can go a long way, a trip to our local aquarium was enough to make me do almost anything. Every birthday or trip request, my answer was the same, “let’s go to the aquarium!” Maybe about once a year, I would get my wish and my family would pile in our car and make the hour-long trek to the shores of Connecticut and Mystic Aquarium. Right on the Rhode Island and Connecticut seaside border lies Mystic Aquarium. Mystic Aquarium is named for the town it lives in, which you may have heard of by way of the not-so-old movie, Mystic Pizza. (Personally, I think the Mexican place across the street is much better.) Just down to road from Mystic Seaport, Mystic Aquarium hosts one of the best marine mammal collections in New England. I’m not proud to admit that the mammals were my favorite when I was young. I had naive dreams of becoming a dolphin trainer at SeaWorld and thankfully, since then, I found a much better family of sea creatures to play with. Back in the day, the aquarium entrance went right into the fish and invertebrate collection. It was dark and cold, and the sheer anticipation of waiting in that hallway to see everything makes me excited even to this day. It was cool from all the air conditioners used to kept the public satisfied, because from personal experience, it is usually a sauna behind those walls. We’d wander the fish exhibits, my personal favorite being the sharks. The exhibits have moved several times in the last 25 years, as exhibits are changed and updated. There used to be a small collection of computers with science-type games on them. “What do the spots on a butterfly fish do?” I was fascinated by this information and would hog the modules until I’d played all the versions. It was my very happy, fish filled cave of wonders. Upstairs was the sea lion show. Way, way back in the day, it was the dolphin and beluga show. The space is much more situated to holding big, sleepy California Sea Lions, but I clapped for the ball bouncing air breathers with the rest of the crowd. Out the back of the building was a long marsh walk to the penguin exhibit. Out of probably 20 birds, there was rarely 1 or 2 making some sort of movement. Unless it’s feeding time, I don’t think they’re very stimulating. (My apologies to the penguin crew.) Continuing the loop around the back of the aquarium past a bunch of other sleeping pinnipeds and you were back at the start. Please keep in mind, that this is 15-20 years ago, back before their major renovation. My hours spent working there happened after the larger entrance was constructed along with the enormous beluga pool. In the beginning, however, this is the adventure I always asked for. 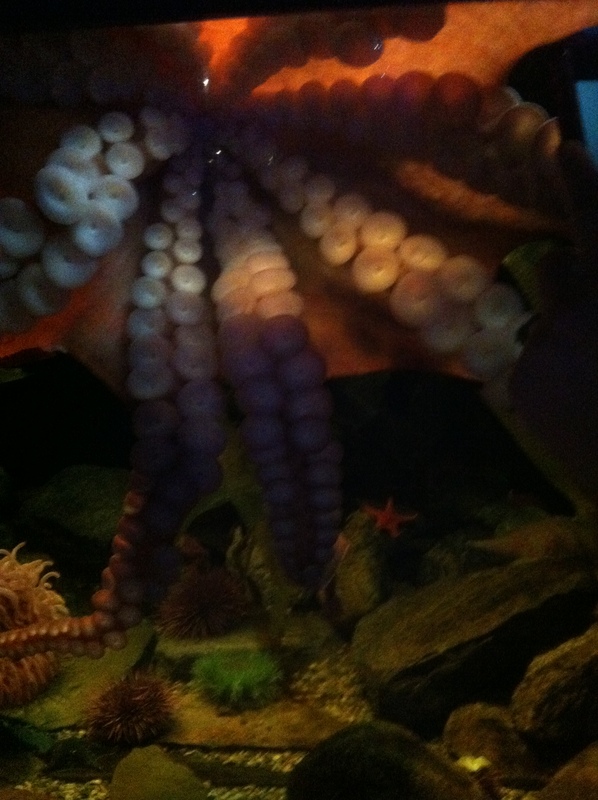 I loved every minute spent at the aquarium, getting a glimpse under the surface into this untouched world. Those hours spent wandering made me yearn to learn more. Books and TV specials could keep me satiated for a little bit, but in the end, I always wanted to go to the aquarium and see them for myself. Even with all the time that has passed, I still love a trip to the aquarium. Living on the West Coast now, this means a similar southern sojourn to the Monterey Bay Aquarium. Significantly larger than Mystic, but lacking the mammal quotient, I could get lost for hours in their exhibits. Since becoming members, my favorite thing to do is attend the late night events, where the aquarium is shut down except for us members. With no screaming, sticky children, giant strollers and bumbling tourists, I can truly appreciate my underwater brethren. It’s probably why our office space is packed with aquariums. Not only to show the public different versions of home aquariums, but to satisfy my unending need to be underwater, if only partially.